﻿﻿﻿﻿﻿﻿Post-processing allows a wide array of enhancements to be made to a photograph. ﻿﻿﻿﻿﻿﻿﻿﻿Before the days of digital photography, when film was king, much of what made a great photograph was the result of what could be done in the darkroom, well after the photo had been exposed in the camera. Photographers knew that once a negative was exposed and processed, the job was only half over and there were still an infinite number of possible looks available for the final print by varying processing times, temperatures, paper types and toners — giving each image its individual look. The famous photographer Ansel Adams once said, “The negative is the score. The print is the performance.” In other words, photography is like music in that the exposed negative is comparable to sheet music, but the print, with all of its potential variations, is the resulting orchestral performance. In today’s digital age, the wet darkroom with its acetate negatives and printing papers is a thing of the past. No longer do polluting chemicals flow freely down the drain, nor do noxious fumes burn the eyes and lungs. Today’s darkroom is a computer with photo editing software that can emulate those traditional photo processes yet yield new and creative visual possibilities from a digital camera file. This digital processing is referred to as post-production, or “post” for short. Many new and advanced amateur photographers say it is an epiphany when they find out that much of what makes a good photograph is a result of post-production, and that a simple snapshot can be turned into a great performance with just a few keystrokes and mouse moves. 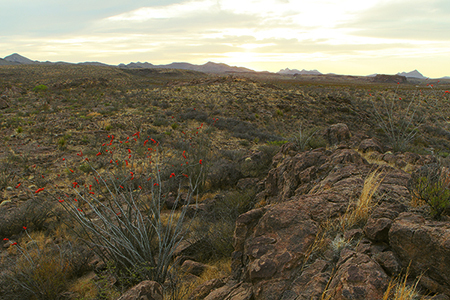 Above: The original camera “raw” image of a West Texas landscape looks flat and unappealing — certainly nothing like the photographer visualized. Below: With the same raw file, corrections to exposure, color balance, saturation, contrast and sharpness result in a photograph with much more visual impact. Most cameras offer the option of shooting images in either a compressed JPEG (Joint Photographic Experts Group) format or in a “raw” format. The advantage of the JPEG format is its smaller file size and a lack of need for post-production enhancement – helpful to those averse to working with images on a computer. Many smartphone and desktop photo apps such as Instagram, Snapseed and Photoshop Express offer creative, ready-made “looks” that can be applied to JPEG images and require no editing experience. However, due to the compression of a typical JPEG file, there is not a lot of creative latitude available other than very basic exposure and color correction. The uncompressed raw format, on the other hand, contains all of the information that the camera’s sensor is capable of capturing and unlocks the creative potential inherent from a wide tonal range and depth of color. As an analogy, if a JPEG file has all of the color possibilities of an eight-count box of crayons, then a raw file is the equivalent of a 125-count box. How many colors would YOU like to work with? Another advantage of the raw file is that you can experiment with an unlimited number of effects without destroying the original file — just like the old-fashioned negative. Once you have finalized the image corrections and enhancements on your raw file in the editing application, you then save it as a JPEG, TIFF or any number of other file formats. Most camera manufacturers furnish free software for processing raw images. Beyond the basic enhancements that can be made in post-production, there are many other creative tools in most applications to make your images truly spectacular. Play with all of them and experiment. There is always the delete key! Here are some basic effects, found in most photo editing applications, that are typically used to add impact and creativity to a photo. Lightening or darkening a photograph can have a profound effect on the overall mood of a scene. Lighter images can convey a dreamlike quality or sense of airiness, while darkening a photo can add drama and mystery. Color plays a big part in setting the mood of an image. Overall image tone as well as individually selected colors can be adjusted as desired. Cool, receding colors such as blues and greens can convey peacefulness, while warm colors such as yellows and reds add excitement and energy. Color saturation can also be increased or decreased to make colors vibrant, pastel or monochromatic. 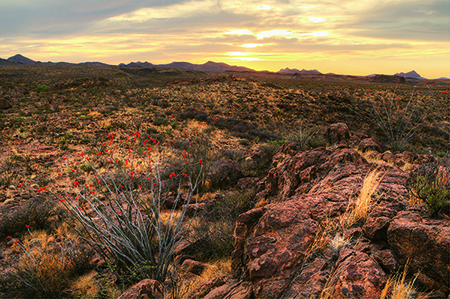 This technique is similar to exposure correction but is localized to specific areas of the photograph. Dodging allows individual objects to be lightened, while burning darkens an object. It is common to slightly burn in the edges of an image (vignetting) to keep the viewer’s eye in the frame. Most digital images can be improved by some additional sharpening. However, care must be given not to oversharpen. Many photographs have been ruined by unwanted “artifacts” created by oversharpening. Conversely, if the mood of a scene is soft, you may consider lightly adding diffusion or even a blur. Play with the effect until you get the desired result. You can always undo any effect before it is saved.